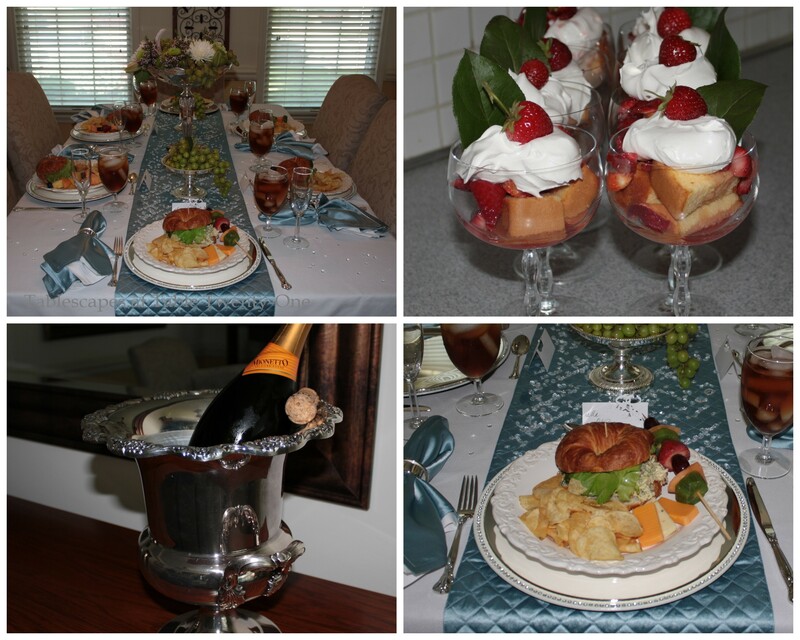 My 60th birthday has come and gone, and all that’s left are the fabulous memories of the ladies luncheon I threw for myself. Yes…I threw my own birthday party! Why? I’m a (retired) professional special event planner. Who else would I put through the torture it would take to make me happy?!! So…here are photos of the June 9 luncheon for 22 of my nearest and dearest in-town friends (all on the guest list were able to attend except one!) who I thank for helping me to celebrate in style! Invitations were created using clearance stationery from Hobby Lobby. I invited the ladies to drape themselves in jewels to go with the theme! I printed the Marilyn Monroe drawing in the corner of each mailing envelope to complement the insert. Me in my party dress, trying to emulate Marilyn Monroe’s look in the pic below! The inspiration for my party dress! When I go with a theme, I go ALL THE WAY! The backdrop for the opening and closing credits of “Gentlemen Prefer Blondes” gave me inspiration to create this elaborate “wall of diamonds” against a pink satin drape on the deck for photos. I simply used drapery clips to hang the fabric and crystal curtains from TableclothFactory.com on existing cup hooks. It was so unseasonably hot & humid, though, that few pics were actually taken out here. On the other side of the deck I hung 3 mirrored outdoor LED chandeliers from Old Time Pottery that looked so cool blowing in the breeze. I planted all pink flowers for the occasion, a departure from the reds and yellows I generally favor. We didn’t have a lot of time to get pics, but this is the dining room seating area. (Because ALL but one of the invited guests accepted, I had to create 2 separate-but-complementary dining environments.) 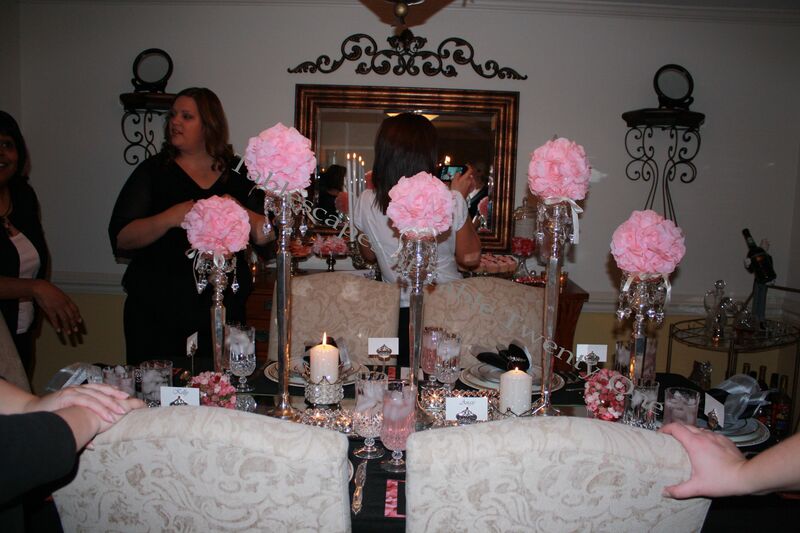 This table is draped in a black crinkle taffeta tablecloth with a silver sequin runner, “diamond” sash, pink ribbon, and mirrored trays beneath the centerpiece of tall gooseneck vases visually joined by a garland of crystal and lots of flowers in faceted vases. (I created 19 total fresh flower arrangements!!!) The buffet behind the table is similarly dressed with another jewelry display. My sweet friend, Cindy, was so gracious as to lend me chiavari chairs for this room which I tied in with the other room by threading through a pink crinkle taffeta sash with a “diamond” cuff. I found the cute poodle art on the sconces on clearance at…you guessed it!…Hobby Lobby. Some may remember the poodle from “French Poodle“, the jewelry display pieces from “Breakfast at Tiffany’s“, the mirror treatment from “Ain’t Misbehavin’ – Celebrating Mom’s 89th Birthday Gatsby Style“, the Princess In Pink signage from “Princess Pink Birthday“, and the faceted & mirrored centerpiece trays from “Happy Birthday, Barf!“. I created the menus using the same stationery as the invitations, strategically affixing tiny rhinestones for a bit more glitz. Each menu was outfitted with a sparkling “diamond” brooch. The weather demanded that we move the bar in off the deck. My friend Rachael stepped in as bartender for the afternoon before joining the other guests at the table. Good ol’ Geoffrey beckoned guests to come grab a cocktail. 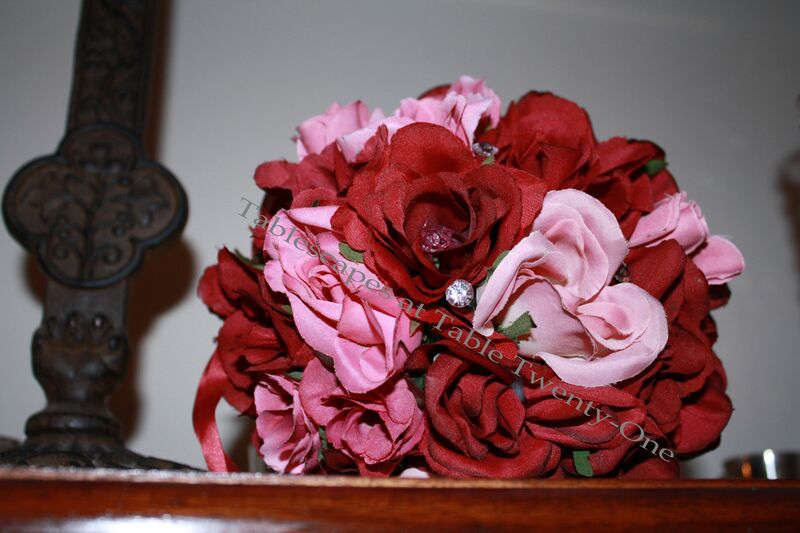 The mantel is simply dressed with more of the facted vessels, some topped with rhinestone studded hot pink rose balls. I know this post was super photo heavy, but I always include lots and lots of details in every event I create. If you’d like to see other fun photos from the party, keep on scrolling! Thanks for stopping in to celebrate the big 6-0 with me and my fabulous pink posse!!! Jeff and Meghan were wonderful servers for the day!!! With my sister, Berishia, who looked so nice in her breezy outfit, and her daughter/my niece, Yvonne, who always rises to the occasion when bling is involved! Friend/neighbor/drinkin’ buddy, Kerry who I simply adore! My dear, sweet, supremely elegant friend Marchita who means the world to me! I cannot tell you how much I love this woman! Ladies and gentlemen…the fabulous Carla!!! Ever-fashionable Mom and daughter duo, Barbara and Rachael! Melanie in her Holly Golightly “Breakfast at Tiffany’s” outfit!!! Jane took it to the hilt looking positively radiant with her Marilyn Monroe look, while my gorgeous Mary Ellen played it sleek & understated. I LOVE all the different ways my friends interpreted the theme!!! Best friend, Sheri, and me in PJs, enjoying a well-deserved and much needed glass of wine after the party. Cheers! This week I’m joining Susan at Between Naps on the Porch for “Tablescape Thursday“, Beverly at How Sweet the Sound for “Pink Saturday“, the ladies at “Celebrate Your Story“, and Linda at Life & Linda for “Dishing It & Digging It“! I treated a couple to a post-nuptial luncheon in our home to celebrate their union. A smattering of “diamonds” brings glitz & sparkle to the wedding tablescape. Bursts of bright green play nicely off the bride’s chosen colors of French blue & white. Granny Smith apples and juicy green grapes are surrounded by green button mums, spider mums, pink waxflower, Queen Anne’s lace, viburnum, and fragrant Stargazer lilies all spilling from a silver pedestal bowl. The main piece is flanked with green grapes atop simple silver pedestals. Each lady’s place setting is marked with an oversized “diamond” napkin ring. The gentlemen have simple “wedding bands” of silver. Two chargers – one rhinestone-rimmed and the other a plain silver – mimic the differences in the men’s and ladies’ place settings. 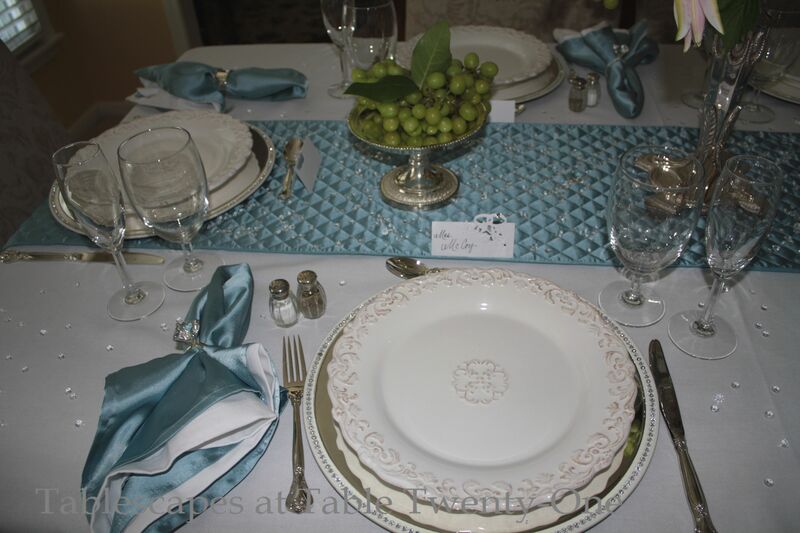 The scrolled-edge cream-colored plates are from TJ Maxx, and the quilted table runner and napkins are from Z Gallerie. Although a simple fare is served (pecan-chicken salad on croissant, honey-dipped fruit on a skewer, assorted cheese slices and kettle chips with strawberry shortcake for dessert), the tablescape still has a decidedly regal feel about it. Just as suddenly as I reappeared last week, I will disappear again after this week as I prepare to go under the knife on Friday. I am both terrified and relieved to have it finally happening. My shoulders have been the source of much pain and anguish for a long time now, and I’m ready to get the first one fixed. My understanding is that using my right arm will be all but impossible for at least 2 months, so I’ll be on the computer only when in the mood to hunt & peck with my left hand. I hope that you will once again forgive my spotty appearances as I go about the business of physical therapy on my way to recovery. I have several tablescapes that I created back in early Spring (including this one) in anticipation of this down time, and I will hopefully be able to post those before summer’s fast-approaching end. Yes, I know the Breakfast at Tiffany’s theme has been done and done and done again. I’m gonna take a pass at it, too, just for kicks. OK? I think it would make a really fun theme for a bridal shower, bridal luncheon, special ladies brunch, birthday brunch (especially a milestone birthday! ), or even a mid-morning engagement party! The table is draped in a sleek black 90″ x 132″ tablecloth from LinenTablecloth.com for the sophisticated look of the proverbial little black dress. This rectangular dining table is set for 6, but would look just as great set on a longer rectangular table for multiple guests or even a round table. I kept each place setting sleek and simple. The white chargers are rimmed in rhinestones. (I wonder if they come with real diamonds at Tiffany’s? 😉 ) The china is very simply adorned Noritake “Spectrum”. The custom-created menus are white paper on black and Tiffany blue card stock embellished with a small gemstone. I included an image of a tiara to mimic the one worn by Holly Golightly in this famous poster. Also notice the print on the menu. I chose two print fonts that closely match those on the poster! Mikasa “Jamestown Platinum” stemware and International Silver “Royal Danish” flatware work well with the place setting. (Get it? Royal Danish flatware? As in Holly Golightly eating a Danish pastry for her breakfast at Tiffany’s??? 🙂 ) A sleek black napkin is folded twice lengthwise and tucked around the charger beneath the dinner plate. What else to serve but breakfast pastries? That was Holly’s breakfast of choice! A blinged out breakfast or brunch calls for a very creative, upscale, but still lighthearted centerpiece. While promotional posters showed a red rose on Holly’s table, I decided to go with clusters of petite white roses in sleek mirrored vases. The arrangements are festooned with big, clunky bursts of bling. Here you can better see the tiered mirror’s edge. 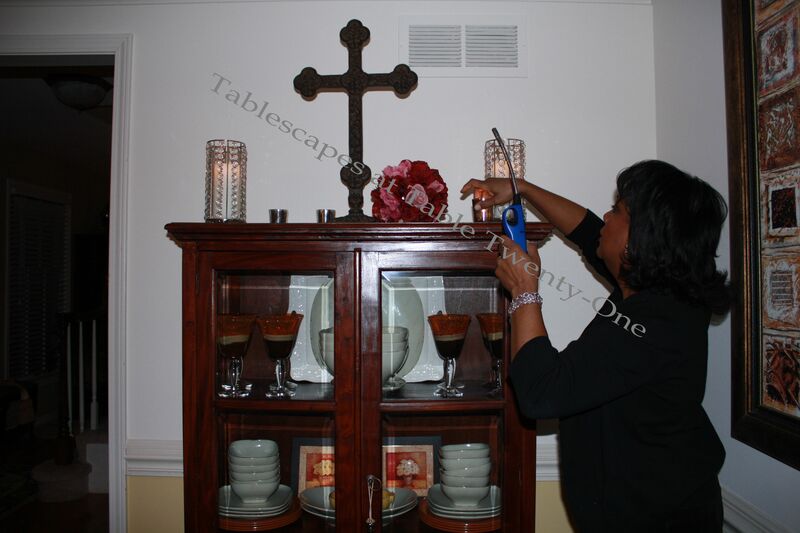 Simple votive candles demurely reflect on each mirror. These Breakfast At Tiffany’s nylon bags were found at Michael’s in the fun stuff aisle! Each bag is adorned with lots of “pearls” spilling out along the side. The buffet behind the dining table holds the goodie bags and displays fun things that Holly might wear including Tiffany’s jewelry, a fabulous tiara, black shades, pearls, and those famous opera gloves. I created a fun centerpiece using a bust form for a Breast Cancer Awareness Luncheon a couple of years ago. This is the same basic concept, but a little more playful. The floral head here has chunky bling shooting out of it and boasts another tiara. I created a replica of Holly’s famous pearl necklace using faux pearl strands from Hobby Lobby. I simply quadrupled them and tied them with a gossamer ribbon at the nape of the neck. I then added a huge brooch to the front of the necklace. Not exactly like Holly’s, but a fun play on it! The promotional poster used as my inspiration piece shows Holly gazing wistfully into the Tiffany’s display window. Hanging in the window are beautiful bling-laden candlelight chandeliers. 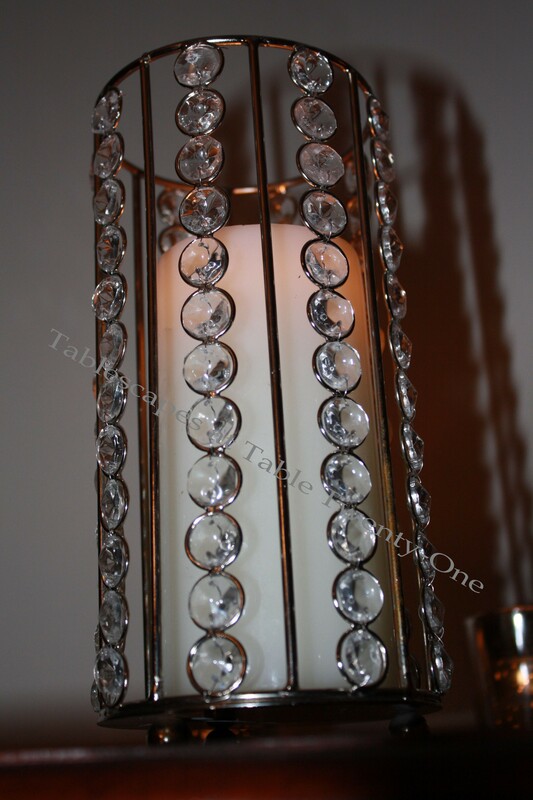 The play on that here is this 5-lite silver candelabra with bling bobeches. Coffee and an assortment of breakfast pastries are served from the vintage tea cart in a corner of the room. As a parting gift, I leave you with my original idea for the bust form. It’s silly, really, but I created it in a weak moment and thought you might get a good laugh out of it. OK…so that’s it. I’m outta here! See you after the snip-snip! I will be joining Cuisine Kathleen for “Let’s Dish!” starting Wednesday at 6:00 p.m., CDT. 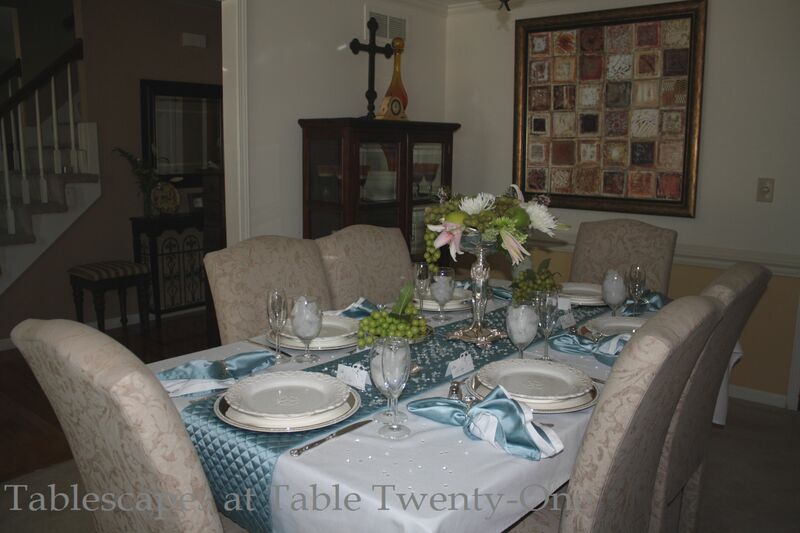 I’ll also join Susan for “Tablescape Thursday” starting Thursday at 9:00 a.m., CDT. Come along if you’d like to get inspired by some really talented tablescapers!!! You can also find me over at BeBetsy.com! INSPIRATION: This prim, proper, and oh-so-Parisian French poodle I bought at Home Goods with a gift certificate I won from Cuisine Kathleen! With Mothers Day on the horizon and this time of year buzzing with bridesmaid luncheons, bridal showers and birthdays, this Paris-themed tablescape using pink, black, cream and white is a fun idea to add a little ooh-la-la to the celebration! 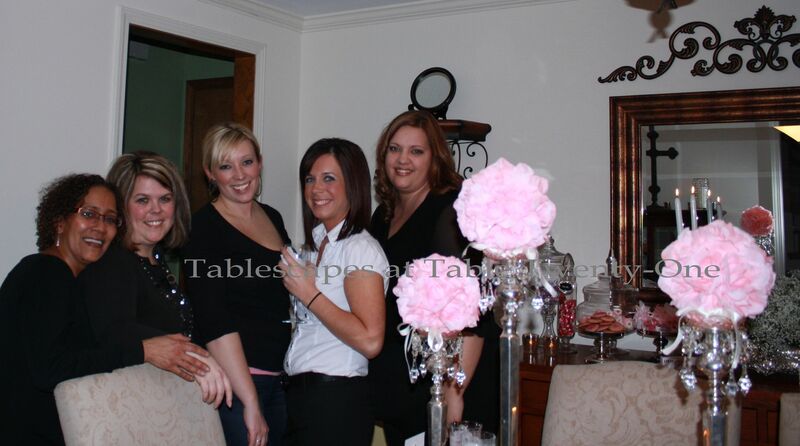 This very girly tablescape begins with a full-length black cloth from LinenTablecloth.com. Black linens are a staple just like the proverbial “little black dress” we all have in our closets because they can be dressed up or dressed down. Each place setting is outfitted with a rhinestone-studded white charger that has been topped with another silver beaded-edge charger. The dinner plates are a simple cream color, and the salad plates in black to finish the look. TIP: Remember…it’s not always necessary to use “matching” dinnerware, but rather pieces that are complementary to one another and the surrounding decor. A soft pink napkin from Bed, Bath & Beyond peeks out from beneath the dinner plate and is highlighted by the black background of the linen. The flatware, passed on to me from my Mother, is International Silver’s “Royal Danish” and the crystal diamond-cut stemware is from the Longchamps collection. Whatever the special occasion, you want to have something fun for your guests to remember the event. These fun little tin boxes (Michaels Ashland Home Decor collection), embellished with either a fleur-de-lis or Eiffel Tower, are topped with a pretty “diamond” knob. They make a great favor in and of themselves (I’m using mine for storing cotton balls, Q-tips and makeup sponges in my dressing room! ), but if you want to take it a step further, add a little gift or edible treat to be enjoyed later. TIP: These tins are on sale this week (thru 4-20-13) at Michaels at 50% off! I L-O-V-E these darling silver Eiffel Tower place card holders from Beau-coup.com. Thanks to the folks there at Beau-coup who were so kind as to send these for me to use in a tablescape. Even the place cards are embellished with tiny fleur-de-lis symbols! I always go on about shopping your home for centerpiece items, and these fun hat boxes from Gordman’s and poufy pink feather boas from Hobby Lobby came straight from my dressing room. I lengthened the centerpiece by adding curvy black lidded ceramic vases from Tuesday Morning and a couple of the larger pink & black tins from Michaels. Silver mercury glass votives dot the area for shimmer and ambient light. This pink & black fashion pillow from Stein Mart is another item found in my dressing room that adds another fun touch to the overall ambience in the room. I like to extend the look on the table to the buffet. This time I used a black ginger jar from Home Goods to display a generous profusion of faux floral branches from Hobby Lobby to add to the feeling of springtime in Paris. Shading herself beneath the floral arrangement with her perfect little nose in the air is Fifi the pink French poodle. Thank you again, Kathleen! I’ll get a lot of use out of Miss Fifi in the years to come! Clockwise from upper left corner: Dianne from “Dianne’s Creative Table“, Teresa from “I Got the Sun In the Morning“, Lynne from “Lynne’s Gifts From the Heart“, Sandra from “The Sweet Sensations“, Liz from “Infuse With Liz“, Ellen from “Scribbler Unfocused“, Debbie from “Mountain Breaths“, and Babs from “Upstairs Downstairs“. Beau-coup.com came through again with a real winner. These glass coasters are great for entertaining! Just slide a photo of each guest into the back pocket, and voila! (I used the photos of some very special blog buddies.) These coasters could work well as a place holder at the table or to simply identify whose drink is whose at a cocktail party! (Imagine your bridesmaids’ delight if you had this at their place setting and then a whole pack of them as a little thank you gift after the shower or luncheon!) The classic damask design around the edges lends to the upscale feel of the room’s design elements. One of the best features: the coasters have little rubber “feet” on the four corner to help stabilize them on any surface! Valentine’s Day is just around the corner, but that doesn’t mean romance is in the air for everyone. There are those among us who are on an earnest quest to find Mr. Right but haven’t yet found out where he’s hiding. There are those who thought they had Mr. Right but had to kick him to the curb because he was oh, so wrong. There are those whose “boo” must be away for that special day (through no fault of his own). And then there are those who just don’t want to share the remote, compromise on what to have for dinner, or worry about falling into the toilet because the seat was left up. For all of you single ladies – whatever your reason – this is a blinged out Valentine tablescape that celebrates you as the carefree diva you are! Red is the color of strength, power, and determination as well as love. Start with a bold red full-length table linen (LinenTablecloth.com) to get the energy flowing in the room. Each glamorous place setting includes a rhinestone-studded charger topped with a second charger in sleek silver for added depth. The delicate design of Noritake “Whitebrook” china conveys sophisticated sweetness and light. A menu card helps to answer the age-old question, “What’s for dinner?” and makes a really nice souvenir. The background of deep red roses works in concert with the centerpiece florals. I used these fun “diamond” napkin rings I found at Tuesday Morning because they go so well with the “Should Have Put a Ring On It” theme! Use your most beautiful pieces to make everyone feel like royalty! Stemware here is Godinger “Chelsea” which isn’t my best, but it sure is one of my favorites! Fun and flirty “Ocean Diamond Dazzle” rhinestone ribbon creates a jazzy runner to visually connect all the centerpiece elements. The frosted white votive holders (Hobby Lobby) have a thin coordinating strip. Lots and lots of red rose kissing balls bring color and texture at two levels. 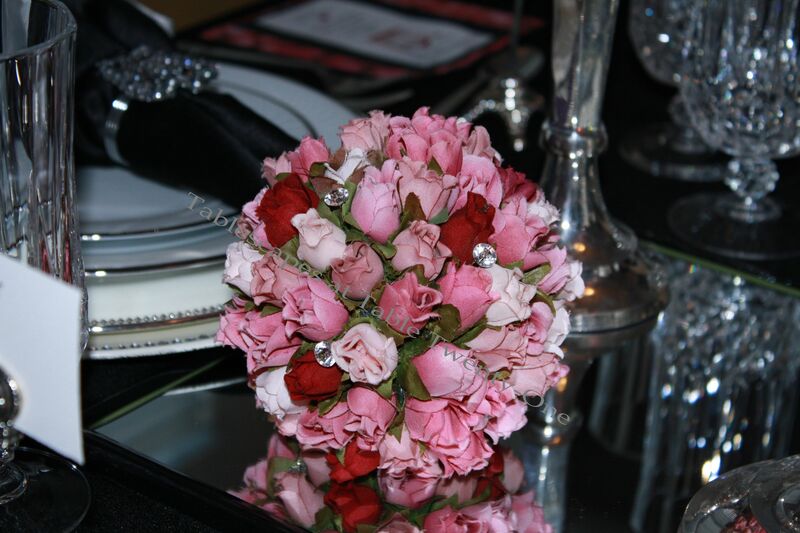 Each rose ball is finished off with rhinestone stick pins for added flair. Faux flowers are used here for demonstration purposes, but by all means go fresh if your budget allows! Fresh flowers bring a dimension to your decorating that nothing else can!!! Indeed, “if [he] liked it, then [he] should have put a ring on it”. If he didn’t, though, consider a glamour-filled evening for friends who share your single status! If you’ve never seen the SNL parody of “Single Ladies (Put A Ring On It)” with Justin Timberlake, Andy Samberg, Bobby Moynihan and Miss Thang Herself, Beyoncé Knowles, click HERE and get ready to laugh until you cry!!! I’m joining Cuisine Kathleen’s “Let’s Dish!” (anytime after 6:00 p.m. CST on Wednesday) and Susan’s “Tablescape Thursday” (anytime after 9:00 a.m. CST on Thursday). I’m sure a lot of love will be in the air, so join me, won’t you? Last Friday before all the snow fell upon our fair city (a full 12 inches where we live!! ), I hosted a Sweet Sixteen X 2 birthday dinner for my best friend’s daughter-in-law. Pink was the “reigning” color of the evening. I found these fabulous crown napkin rings at…you guessed it!…Z Gallerie!!! I made the menus using heavy black paper topped with fabulous rose petal pink paper I found at Hobby Lobby. I printed the menu in color on plain white paper and then blinged it out with faux gemstones to give it that purely regal look! To bring color closer to the table deck, I used these pretty little multi-hued rosebud kissing balls that I made several years ago when I was feeling kind of crafty/bored. Again, I added rhinestone stick pins for this occasion. I don’t always change the decor on top of the rustic china cabinet in the dining room, but this time was an exception. Another style of rhinestone candle holder and another larger homemade rose kissing ball shared the stage with my usual iron cross and a bevy of mercury glass votives. A confection bar fit for a princess! OK…so I’m a sucker for baby’s breath!!! I can’t help myself!!! This just looked so great in this ornately carved silver epergne. (I purchased 14 of these epergnes wholesale for my fine rentals business several years ago and just haven’t been able to part with them!) I replaced the candle lamps that came with the epergne with plain white metal case candles. The little wooden princess signs were purchased at Hobby Lobby, and I affixed lots of “bling” to the crowns on them for a sparkly 3-D look. Pretty pink confections on the candy bar include M&Ms, Tootsie Rolls, Hershey’s kisses and heart-shaped marshmallows in clear glass apothecary jars. Engraved silver tags identify the various candies. Sheri, the birthday girl’s mother-in-law/my best friend, baked the pink-sanded sugar cookies that just somehow kept leaping up into my mouth. 🙂 Party favors in pink organza bags were displayed on a silver beaded-edge stand. Each guest went home with the organza bags stuffed with candies and cookies, plus a vial of exclusive perfume. What proper princess doesn’t have something with her initial prominently displayed? For Princess Stacy, it was a silver cake plateau full of luscious pink cupcakes! This tasty confection was served alongside a mini martini glass (Crate & Barrel) filled with strawberry ice cream. The guests checking out the dining room before dinner. This tablescape would also work incredibly well for Valentine’s Day, to honor a breast cancer survivor, a bridal shower, or as head table for a very blinged out wedding! I’m delighted to once again join Susan and the other talented tablescapers at Between Naps on the Porch for Tablescape Thursday. I was so taken with the black and white components of last week’s table! So when I volunteered to host an intimate dinner for friends who are running off to New Orleans to get married, I thought I’d use those colors again, this time infused with silvery gray. (Seriously, though…do you really “run off to get married” in your 50s? I’m in my 50s, and it would be more like “leisurely strolling off”…or “limping off.” I actually added the silvery gray to complement our hair color!) 😉 This time the colors are paired with more upscale china, stemware, flatware and other decorative accoutrement. I hope you like it! There’s just something about decorating with black and white that renders such a profound sense of elegance! Adding touches of gray or pewter or slate seem to make it that much more so. My sister’s classic Noritake “Whitebrook” china is always a lovely start to conveying formality and tradition. The china is set atop a double layer of chargers – one beaded silver and the other a rhinestone-studded white. Against the black of the table linen, the dishes really stand out. My favorite International Silver “Royal Danish” sterling flatware always looks great on a formal dining table. When setting a formal dining table, I tend to forego fancy napkin folds and just go with something fairly staid. Adding a sheer silver organza beneath the black adds a bit of flair. The clustered dragon tear napkin rings add a bit more shine without going too far overboard. These “Bella” wine stems from Z Gallerie are fast becoming a new favorite! The top color reminds me of the color of mercury in the old maximum thermometers. Very sultry! Each person’s place is marked with a faux mother-of-pearl and rhinestone frame. I found this fabulous “Josephine” table runner in velvety soft pewter at Z Gallerie. I love the gentle scrolling. This would also make a great New Year’s Eve tablescape!!! I’m teaming up again with Susan and the other tablescapers at Between Naps on the Porch for Tablescape Thursdays. After perusing my photos, you’re invited to join us there!